Mining, including surface, underground, and open-pit operations, has been an important economic activity in Pennsylvania since before the 1860s and was instrumental in the Commonwealth’s development and continues to be a major industry. 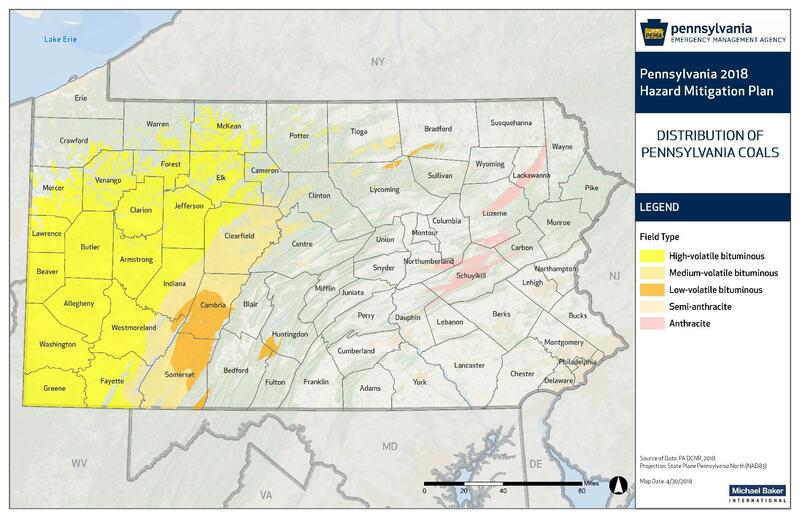 Counties underlain by coal deposits are at highest risk of environmental hazards resulting from coal mining activities, including the majority of southwest Pennsylvania, situated over the Commonwealth’s main bituminous field, as well as the jurisdictions in northeast Pennsylvania located over the anthracite fields, particularly in Lackawanna, Luzerne, and Schuylkill Counties. 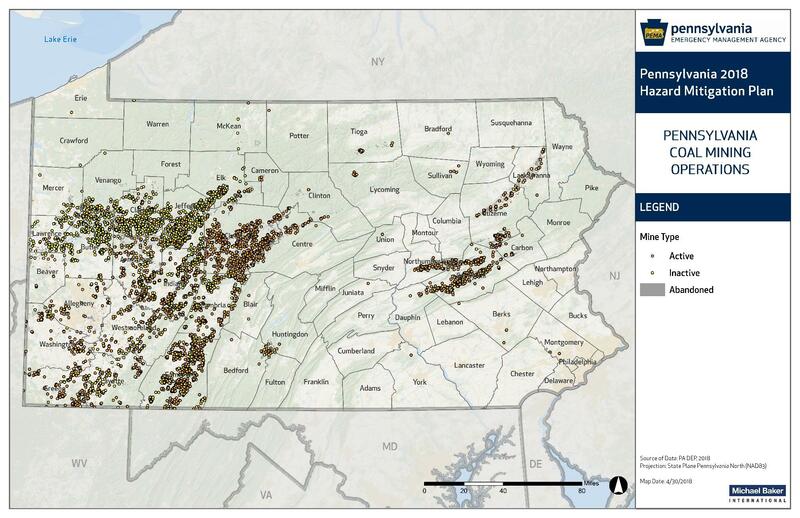 Statewide, 48 counties contain at least one active or abandoned coal mine with the highest concentration of mines in western Pennsylvania which is underlain by coal seams. Two western Pennsylvania counties, Jefferson County and Somerset County, contain the highest number of coal mines in the state with 1,393 and 1,694 mines respectively. Major impacts from mining include surface-elevation changes and subsidence, modification of vegetation, the chemical degradation and flow redistribution of surface water and groundwater, the creation of mine voids and entry openings, adverse aesthetic impacts, and changes in land use. The EPA estimates that over 3,000 miles of streams in Pennsylvania have been contaminated by acid mine drainage which occurs when metal sulfides in rock oxidize and generate acidity in nearby waterways. Slurry ponds and tailings dams are also potentially dangerous, as mineral byproducts from coal mining are pumped to slurry or tailings dams for removal by sedimentation. If the dams or structures supporting the slurry ponds fail, they pose hazards similar to dam failure. In addition, active and abandoned mines can also result in injury and loss of human life. This can occur in active mines where workers are injured or killed by mine collapse, entrapment, poisonous gases, inundation, explosions, fires, equipment malfunction, and improper ventilation. Injuries and death, such as All-Terrain Vehicle (ATV) accidents, falling, and drowning, can also occur in abandoned mines. The worst-case scenario event in Pennsylvania mining history occurred in 1962 in Centralia, Pennsylvania when an underground fire began in the coal mines underneath the town and continues to burn today. Since 2011, there have been seven deaths in Pennsylvania resulting from surface and underground coal mining activities (MSHA, 2018). To view a printable pdf file of the Human-made Hazards Risk Assessment, click here. Click on an icon below for a summary of each hazard. Distribution of Pennsylvania Coals (PA DMCR, 2018). Coal Mining Operations in Pennsylvania (PA DEP, 2018).